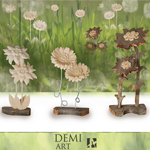 In order to welcome the long-awaited spring on our website, we have designed and added new flowers to our catalog. The Edelweiss and Gerberas announce us the warm season and could be a nice small Easter gift for a loved one. They are also very suited for decoration. Take a look at our new arrivals! previous: Modern Cuckoo Clocks - they keep decorating our walls!